The Write Recipe — featuring great recipes by writers and artists. ½ cup oil (if you have a half a cup of rendered bacon fat on hand … that’ll do too but I’m trying not to kill anyone. Fill your cake liners about 2/3 full. 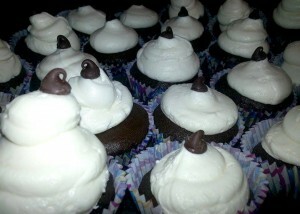 You don’t want them overfilled and you don’t want a wimpy cupcake. Bake for 18-22 minutes. Times will vary according to ovens but use your nose and a trusty toothpick. If they smell baked, it’s usually a great indication they are. And if a toothpick inserted comes up dry, you win. 3 T milk or heavy cream if you have it. *I have been baking since I was big enough to reach the table and the most important thing I learned as far is making buttercream is the importance of letting your butter soften correctly. Don’t jam it in the microwave and try to half melt it soft. This will not work. If you MUST use technology to help the process, I recommend a very low setting (like defrost) in thirty second increments. Trust me. Hard butter makes for curdled frosting, yes. But too soft or melted butter makes for a runny mess. Beat your butter and sugar on a low setting, lest sweet snow will fall in your kitchen! Once it starts coming together you can kick up your setting to medium and add your vanilla. Beat at medium for at least a minute. It will become fluffier and more tempting as you aerate the mixture. Add milk a little at a time until the spreading consistency you want is reached. Change your Chocolate Stoopids to Hell Kitties by adding a half tsp cayenne pepper to your dry mix.